This is a large, convoluted issue with way too much going on to really summarize and address in any great detail in the general length I allow myself, and to do so without having to go into a lot of detail. Essentially, an infinite multiverse has been condensed down to one universe, though a bunch of heroes from parallel universes remain, having been outside time when that consolidation occurred. They’re split up to address issues on multiple fronts…namely the Anti-Monitor. Said villain just refuses to go down and STAY DOWN, rising multiple times from seeming defeat. 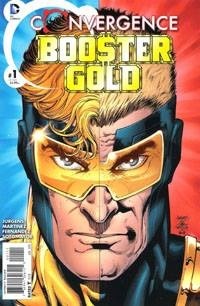 In the course of this, a number of elements get loosely addressed, we have some characters killed off, others get a sendoff, and others simply get brief appearances with loose/quick details "setting stuff up" for moving forward (such as Wally learning of Barry’s death and becoming Flash instead of Kid Flash). While I tend to like and appreciate Wolfman‘s art, and certainly enjoy Perez and Ordway both, reading this issue was a chore. 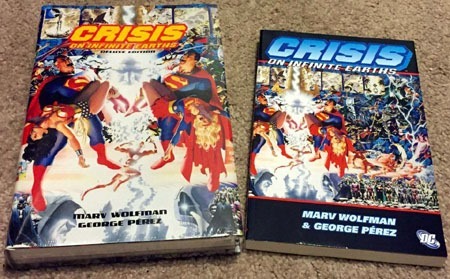 I first read it about a decade ago–sometime around Infinite Crisis, if I recall correctly–having "finally" sought out the collected volume to actually read the "original Crisis" for myself given its 20-year anniversary had cropped up with a "sequel" of sorts (yet, amazing to consider yet another 10 years have passed and we’ve had a 30-year anniversary edition!). 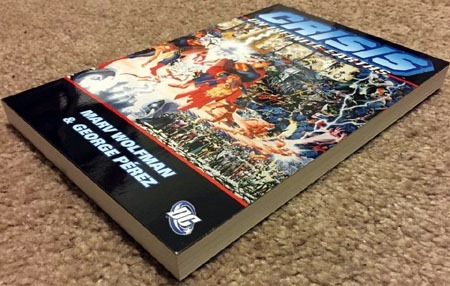 Given what it is, and dealing with an entire universe and wrapping up stuff from a year’s worth of issues and all that, I have no real problem with the story…it’s just dense and seems like it has a huge amount of ground to cover in its limited pages despite being an extra-sized issue. The art, of course, is fantastic–Perez and Ordway teamed up? Doesn’t get much better than that! The creative team as a whole packs a heckuva lot into this, which I do like; but I can only imagine what I’d feel about it if it were a brand-new issue in 2016. While we do have the "ultimate defeat" of the Anti-Monitor in this issue and a bit of an epilogue explaining a few things, overall this issue itself caps off the series, and I feel like I missed a lot by not reading the previous couple issues, and lost the scope or "epic-ness" of the story jumping in on this alone. As the story has been a "complete, full story" for three decades, I don’t think I’d recommend this as something to just sit down and read as an isolated issue. 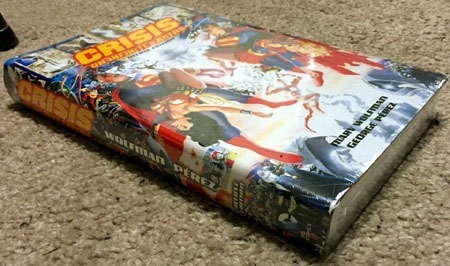 It’s sort of neat to flip through and see just the isolated chapter rather than the final segment of pages in a collected volume…but I think Crisis works much better read as a whole than just grabbing an issue. For a 25-cent issue, it’s not a horrible read…but there’s certainly a lot of nuance that I am not picking up on given the decade’s space between this and when I last read the earlier issues. A “bonus” feature (as far as I can tell, included with the barebones DVD, the special edition DVD, and the BluRay) is an animated short starring The Spectre. This is a bit of an unusual piece to me–I’ve really only known the character as the primal/cosmic/universal force-of-naturehe’s been for the last 10 1/2 years. This short focuses on the character with Jim Corrigan as his “host,” where Corrigan grounds the Spirit of Vengeance a bit. This short delves into some dark, disturbing territory…whether intentionally going there or taking advantage of less restriction due to being packaged with a PG-13 animated film, I’m not sure. Not being particularly familiar with a down-to-Earth Spectre, I found it to be less interesting than I’d prefer in and of itself…but it’s still fairly interesting being exposed to this version of the character. There’s also a preview of the next DC Universe project…Batman: Under the Red Hood, which is based on the 2003/2004 Under the Hood arc in the Batman comics. While I have never bought into the “Return of Jason Todd” and everything that’s been done with that character for more than half a decade…as an animated project, it looks like this one has potential…at the least, this preview/”First Look” sold me on the concept. A large part of that, I think, is that it looks like the film will include material taken from A Death in the Family, which will more closely tie the Under the Hood story to that prior one, making it work as a unified whole in the film where it still has not for me as a comic story that essentially undid a key story in the Batman history. Finally, there’s a short documentary that looks at the recent history of DC Comics, with brief interviews with the likes of Paul Levitz, Dan DiDio, Geoff Johns, Brad Meltzer, and others discussing Identity Crisis, Infinite Crisis, and Final Crisis, and a lot about how the stories were crafted and made to build toward one another. The interviewees also discussed what got them into comics, and their influences…and in general, made for a very enjoyable piece. Of course, it was also interesting to see several of their roles/titles, given changes announced last week for the organization at DC. I’m a sucker for such documentaries/interview pieces…I enjoyed the Death of Superman retrospective, the Green Lantern/Blackest Night piece on the Green Lantern: First Flight release, and of course this one. Now we have the second Justice League movie. Though it is the second under the Justice League header, it’s really no sequel to New Frontier. This one is based on some classic Justice League stories known to me under their contemporary heading of Crisis on Multiple Earths. 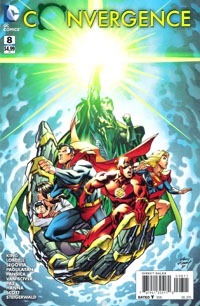 These comics–as I understand my comics history–were largely regular team-ups between the Justice League and the Justice Society…then situated on different Earths in DC‘s multiverse. 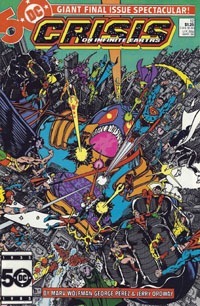 Though the multiverse has long since perished and recently been reborn, those stories still hold quite a bit of weight. And so we have this movie, in which a Luthor crosses from his Earth to that of “our Earth”–that is, the Earth in which we find the DC super-heroes–and reveals this multiverse. He convinces the Justice League to help him on his world, to “free” it from the evil that terrorizes it. Whereas on our Earth, the most powrful beings are heroes, on Luthor’s Earth, they’re villains. There’s a LOT to like about this movie. The animation is nice and clean–plenty of detail for what it is, without being overly detailed or trying to be some sort of “animated live-action.” The visual style doesn’t seem to imitate silver age comics that I’m aware of, nor does it exactly imitate contemporary comics. There’s something to it that reminds me very much of the Batman, Superman, and Justice League animated series–probably in part that Bruce Timm is heavily involved in this movie as he was with those series. I was initially disappointed that we had more new voices for familiar characters…but as the movie kicked into gear, I didn’t really even think about it, other than to note that the characters all sounded perfectly fine and no one seemed out of place…I heard the characters, and not the actors…which for me is an important thing for any animated project. To me, The Flash had several of the greatest moments–a comment about Luthor’s state when they meet him; a Star Wars reference, and a nice play on things when rushing out of the Crime Syndicate’s place after his teammates. Owlman had a great Harrison Ford moment, which I’m not sure was intentional, though it almost seems it had to have been. And toward the end, Wonder Woman’s “spoils of war” is just about my favorite silver age reference ever–legitimizing a concept I always saw as ludicrous. The “meat” of the movie was solid stuff, as well. Granted, with a team movie, there’s not a lot of room for character development, especially in the relatively limited timespan for these animated movies. The only thing that really felt forced to me involved a romantic interest for the Martian Manhunter (even if there was a bit of payoff in his final comment on the matter). This isn’t a character study on any single character…it’s an action/adventure pitting many familiar characters against many similar/opposite characters. There seems to be plenty drawn from the original 1960s comics…and yet, a strong dose of contemporary story-telling. These DC Universe dvd movies just keep getting better and better, and though I haven’t yet digested this one long enough to decide if it surpasses the previous ones…it certainly keeps up with the best of ’em. While in many ways, an animated/movie adaptation of ‘The Death of Superman REALLY gets to my core as a comic person–it was largely that story that fully submerged me long-term into the world of comics, and so it has a special place in my memories–that first movie from DC Universe is probably my least-favorite. To this day, several years after-the-fact, I tend to hold that its only redeeming quality is the retrospective documentary on the Death of Superman in the comics. (It doesn’t help that they LATER released a special edition, while subsequent movies have had simultaneous “bare bones” dvd release and a Special Edition release). Batman: Gotham Knight was an interesting piece, giving a taste of Batman with the anime style…I actually enjoyed it for the most part, and while that is not a style I’d care for long-term for Batman, it definitely worked. Justice League: A New Frontier became an instant favorite for me. There was something to its story–and perhaps the fact that I had not read the comics first (and yet, had had them repeatedly recommended to me). I read a one-shot DC put out around the time of the movie’s release and enjoyed it, and shortly after bought the TPBs of the comics, and greatly enjoyed those, such that as a whole, the New Frontier is a definite DC classic to me. A combination of things led to my NOT picking up the Wonder Woman movie, though I Netflixed it, enjoyed it, and numerous times now would have bought it, if any stores would stock the “Special Edition” WITH the stupid cardboard box/slipcase thing. (Petty, sure…but that’s a story for another time). Green Lantern: First Flight sorta crept up on me, but with Blackest Night then just barely kicked off, I was on a Green Lantern high, and was very excited for the movie. Though it was kinda strange in its depiction of Abin Sur and others, in and of itself I recall really enjoying it–especially the use of Sinestro, AND his Sinestro Corps costume…as well as the way it was left open for “sequels.” That it came with an exclusive Hal Jordan DC Infinite Heroes figure (well, if one bought the boxed version at Best Buy, anyway) was an added bonus. I’ll also always remember buying a new DVD player the same day in order to watch the movie, as the old DVD player my roommate and I had been using refused to recognize the new disc. A little over two months later we got Superman/Batman: Public Enemies, and in anticipation of that one, I re-read the original comics, and thus both enjoyed and yet nitpicked it a bit more than I may have otherwise. I particularly enjoyed the voice casting, getting the “original” actors from the Batman: The Animated Series and Superman: The Animated Series to voice Superman, Batman, and Luthor. That the art was so similar to the original made it even more of a treat.